Successfully Added 10.4 Inch Display Roof Mount TFT LCD Monitor - x2 AV IN to your Shopping Cart. Car roof mounted LCD monitor with two Video IN and one R/L Audio IN connections for displaying audio and video images to backseat passengers. This low priced car AV system is quite easy to install with just a little knowhow and features remote or button control, a rotating screen that will go 55 degrees to the left or the right, dome lights for night time conditions, high brightness and contrast, and 800x600 resolution at 500TV Lines. 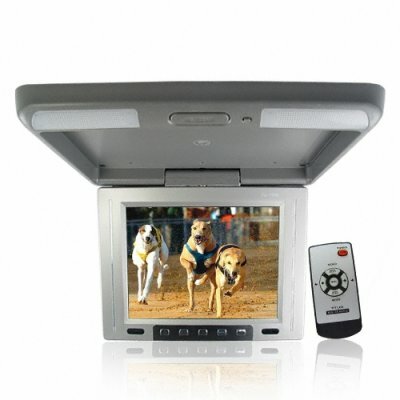 Connected to AV devices such as a DVD player, rearview cameras, this is a very useful device indeed, and comes with Chinavasion's automatic 1 year warranty and easy international shipping from your choice of multiple shipping agencies..